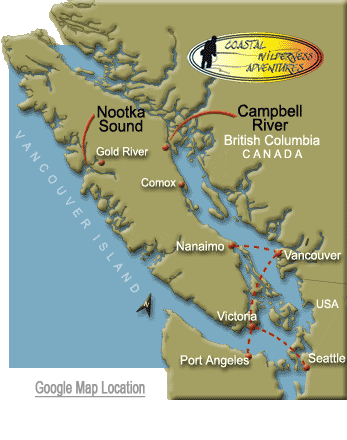 Vehicle travel to Campbell River on Vancouver Island is quite easy! A straight and fast, inland highway (19) on Vancouver Island speeds travel time by vehicle – or take the scenic shoreline highway (19A); it’s a little longer drive, but if you’re looking for ocean scenery this may be your choice. The Horseshoe Bay terminal is located on the north side of Vancouver, and is best if you want to see Vancouver. Check out this map (north on map) for directions to the Horseshoe Bay Ferry Terminal. Follow the Departure Bay-Nanaimo lane. From Departure Bay it is an approximate 1 hour and 30 minutes drive to Campbell River on the Inland Island Hwy (19) north. h end of Vancouver. This is the best route if you are traveling from the Vancouver International Airport, the US border or wish to bypass Vancouver. Check out this map (south on map) for directions to the Tsawwassen Ferry Terminal and get in the Duke Point-Nanaimo lane. From Duke Point it is an approximate 1 hour and 45 minute drive to Campbell River on the Inland Island Hwy (19) north. This route is for travelers who would like to visit Victoria, the capital city of BC, before making their way north to Campbell River. When arriving at the Tsawwassen Ferry Terminal, get into the Swartz Bay-Victoria lane. From Victoria, drive approximately 3 1/2 hours to Campbell River on the In-land Island Hwy (19) north.